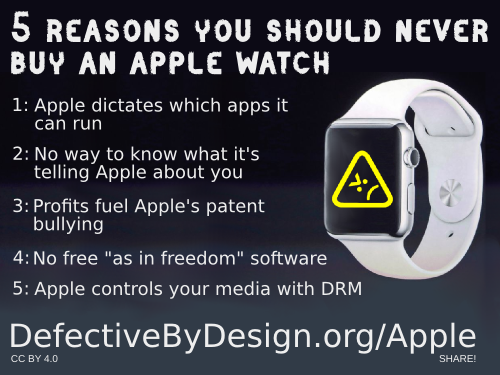 Apple's devices are chock-full of Digital Restrictions Management (DRM). They won't allow you to replace the operating system with a free one, or even to install 3rd-party free software applications. The company uses its massive arsenal of patents to bully software developers that make things that resemble Apple's products, even by accident. Despite all this and more, most people have no idea what Apple's up to. To learn more details behind the five reasons, and to take action by telling Apple you won't stand for their abuse, check out DefectiveByDesign.org/Apple. Unlike Apple, we don't have millions to burn on commercials. But we can build a movement for digital freedom and self-determination from the ground up. We need to use tools like this image to show our friends and communities -- and Apple -- that we know what these devices are really all about: control. With the support of the Free Software Foundation, developers are bringing the free software mobile operating system Replicant to more devices all the time. See the list of currently supported devices or help the project expand it with a donation for more test devices.